Last month our we traveled to Kiawah Island in South Carolina. I will share more about our trip soon, but in the meantime, I’m excited to share some of the recipes and food stories inspired by our travels. On our last night there, we had a rather uneven meal with some dishes being great and some being almost embarrassingly disappointing. The thing that stood out the most that night was a very simple appetizer platter we had including some shaved ham, hard boiled, eggs, pimento cheese, and pickled okra. Caroline and I in particular are pickle fiends, and this was right up our alley. When we departed the next day, we visited the Charleston farmers market before hitting the road for the long drive home. We were browsing through the gorgeous bountiful piles of fresh produce when Caroline pointed and exclaimed, “Look Mom! PICKLES!” It was a huge pile of okra. 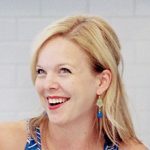 It made me giggle (and still does whenever I think of it), but it also made me buy a big bunch of okra to bring home and make into pickles for my girl. Thanks to my voluminous cookbook collection, I found a perfect recipe to use and got to work. As with most pickles, these are incredibly simple. 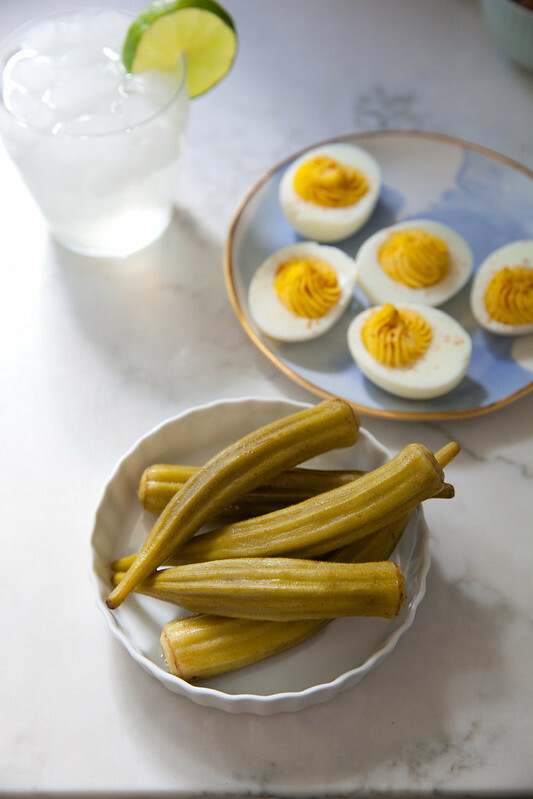 The resulting pickles are crunchy, tangy, barely spicy, and definitely irresistible. 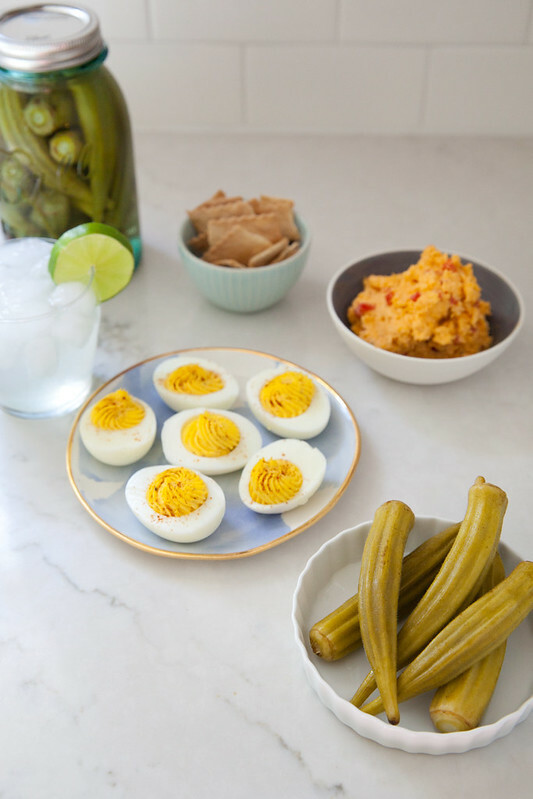 Put them out for an appetizer spread with deviled eggs (obviously > hard boiled) and some pimento cheese and it will be a smash hit. 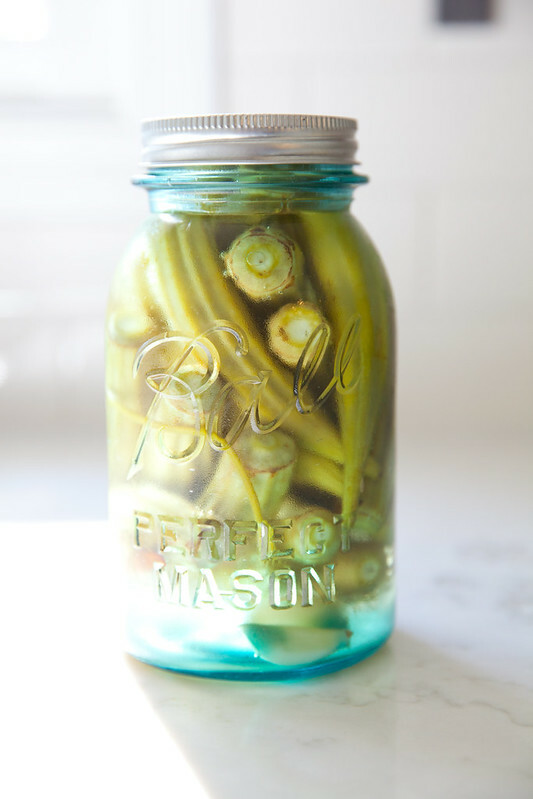 I did exactly that this week when hosting some friends to dinner and let’s just say, I need to make some more pickled okra this weekend! Fill a large pot three-quarters full with water and bring to a boil. Using tongs, carefully place the jars in the water on their sides, along with their lids, to sterilize them. Boil for 15 minutes, then remove with tongs or a jar lifter and set aside. Trim the ends of the okra pods to remove any woody millimeters from the stem. In a bowl, combine 1 quart of water and 1 tablespoon of the salt. Stir to dissolve the salt, then add the okra to the bowl. Cover and set on a cool countertop (away from direct sunlight) or in the refrigerator. Let soak for 2 hours. Drain and rinse the okra pods. Pat dry with a clean dish towel. Using tongs, place 1 chile, 2 sprigs of dill, and 2 garlic cloves in each of the jars. Then pack the jars with okra. In a second pot, combine the vinegar, remaining 1½ cups of water, sugar, peppercorns, and the remaining 2 teaspoons of salt. Bring to a boil over high heat. Once boiling, reduce the heat to medium-high and simmer for 4 minutes. Pour the hot brine over the okra using a liquid measuring cup with a spout until it comes to ¼-inch below the rim of the jars. Place the lids on the jars and seal, then turn the jars upside down so they are standing on the lids. Pickled okra will keep for about 4 weeks in the refrigerator. Note: You may want to have additional garlic, dill, chiles, and brine ready to go as well as an extra jar or two. With the amount of okra called for, though I packed the jars very tight, I needed a third jar to pickle all of it.